1824 June 26th. 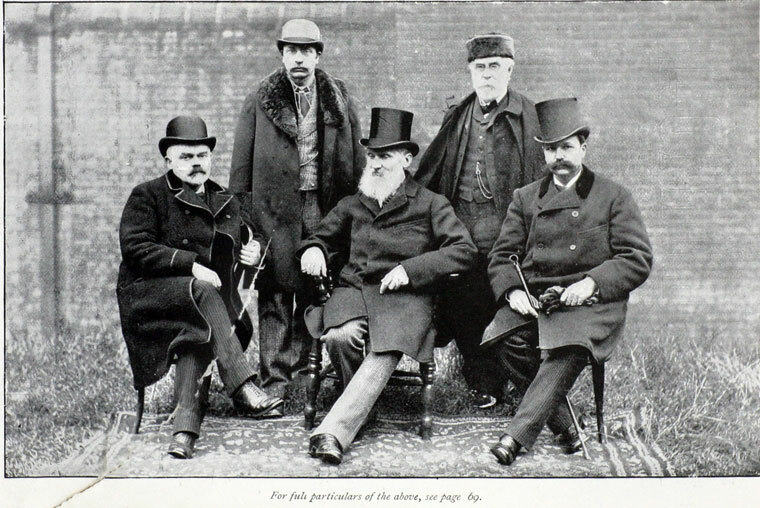 Born in Belfast, the fourth child of seven, the son of James Thomson. His mother died when he was six years old. His father, a textbook writer, taught mathematics, first in Belfast and later as a professor at the University of Glasgow; he taught his sons the most recent mathematics before it became part of the British university curriculum. 1834 At the age of ten, William, and his eleven-year-old brother James, were enrolled at the University of Glasgow. William was introduced to the advanced and controversial thinking of Jean-Baptiste-Joseph Fourier when he borrowed Fourier's book 'The Analytical Theory of Heat' from one of the professors. This applied abstract mathematical techniques to the study of heat flow through any solid object. 1839 Thomson won many prizes while at university in Glasgow. Aged only fifteen his mathematical talents were demonstrated when 'An Essay on the Figure of the Earth' won him a gold medal. His striking and original essay was a source of scientific ideas for Thomson for the rest of his life and he continued to use it as a reference until he died. 1840/41 Thomson's first two published articles, at the age of sixteen and seventeen, years old, were in defence of Fourier's work - then under attack by British scientists. Thomson realised that that Fourier's mathematics, although applied solely to the flow of heat, could also be used in the study of other forms of energy. This could apply to both fluids in motion and electricity flowing through a wire. 1841 Thomson went to Cambridge. Whilst a student there he was awarded silver sculls for winning the university championship in racing single-seater rowing shells. 1845 He attained his B.A. degree with honours. He obtained of George Green's 'An Essay on the Application of Mathematical Analysis to the Theories of Electricity and Magnetism', which, together with Fourier's book, formed his theories on the mathematical relationship between electricity and heat. 1846 At the University of Glasgow, a vacancy occurred in the chair of natural philosophy and his father then engineered it so that Thomson was proposed for the post. With unanimous election, William Thomson took the chair at the age of twenty-two and remained there for the rest of his career. 1847 Joule's theory on heat and motion was discussed at a meeting of the British Association for the Advancement of Science, which was attended by Thomson, whose theory contradicted the beliefs of the time. The two men then discussed the implications of Thomson's new theory. 1854 Thomson began research into cables, following from Faraday's prediction that signals would become diminished. Thomson drew the relationship between current at the distant end with resistance and capacity: the retardation would be proportional to the square of the length of the cable. His work on the cable project began when he was asked for a theoretical explanation of the apparent delay in an electric current passing through a long cable. His reply, with equations describing the flow of heat through a solid wire, proved applicable to questions about the velocity of a current in a cable. 1856 Thomson became a director of the newly formed Atlantic Telegraph Co and so could test his theories. Later that year he developed a device for receiving messages which was used for continuity tests and for signalling to shore during the cable-laying expeditions that followed. 1857 The first attempt to lay the Atlantic cable failed, but Thomson's active role in subsequent attempts ensured success in 1858. Success was short-lived as within months the insulation of the cable had failed. Thomson risked his life several times during the laying of the first transatlantic cable. Over the next eight years Thomson strove to correct the problems and lay the cable successfully. 1866 He was knighted by Queen Victoria and raised to the peerage in recognition of his work in engineering and physics. 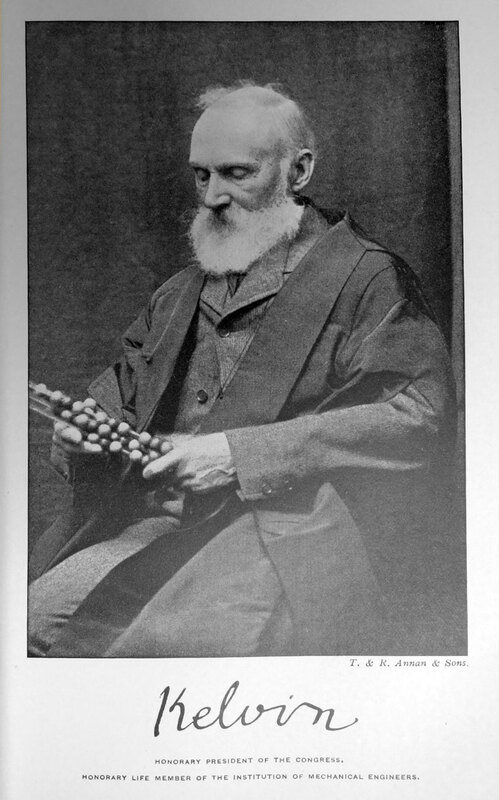 He was known as 'William Thomson, Baron Kelvin of Largs', also called 'Sir William Thomson'. His theoretical work on submarine telegraphy and his inventions for use on submarine cables helped Britain to secure a prominent place in world communications during the late eighteen hundreds. 1873-78 Thomson reformed the mariners' compass to minimise oscillations and to correct errors arising from the magnetism of the ship's hull. He invented a tide machine, which predicted the rise and fall of the tides for any given port in the form of a continuous curve recorded on paper; the entire curves for a whole year could be inscribed automatically by the machine in about four hours. In his last years he rounded off his thermodynamic work by enunciating the doctrine of available energy. 1899 Thomson resigned his chair at the University of Glasgow, at the age of 75 - "to make way for younger men." Thomson's contributions to 19th-century science were many. He advanced the ideas of Michael Faraday, Fourier, Joule, and others. Using mathematical analysis he formulated the concept that was to be generalised into the dynamic theory of energy. He also collaborated with a number of leading scientists of the time including, Sir George Gabriel Stokes, Hermann von Helmholtz, Peter Guthrie Tait, and Joule. With these partners, he advanced the frontiers of science in several areas, particularly hydrodynamics. He also originated the mathematical analogy between the flow of heat in solid bodies and the flow of electricity in conductors. By the end of the century, however, Thomson, having stuck by his belief, found himself in opposition to the outlook that would be the precursor to 20th-century quantum mechanics and relativity. As a result, this eventually placed him counter to the mainstream of science. 1907 William Thomson died on 17 December, at Netherhall, near Largs, Ayrshire, Scotland. William Thomson, BARON KELVIN of LARGS, was born in Belfast on 26th June 1824, being the second son of James Thomson, teacher in the Royal Academic Institute of Belfast. The father had attended the University of Glasgow, which appointed him to the Chair of Mathematics in 1832. His two sons — James and William — matriculated at Glasgow in 1834. They had been prepared by their father — a self-trained man of considerable ability and energy. Both the boys made the best use of their time, but William did not take any degree there, and it was only in 1896 that his first University conferred the honorary degree of LL.D. on him. In 1841 he proceeded to St. Peter's College, Cambridge, where he gained a Second Wranglership, followed by being Smith's Prizeman in 1845. In the same year he was elected a Fellow of Peterhouse. Soon after he went to Paris and studied for one year under Regnault, then engaged in his determination of physical constants. In 1846 the University of Glasgow offered to him, at the age of twenty-two, the vacant chair of Natural Philosophy, which he accepted and held till 1899; and it is as a natural philosopher that he will be revered in the future. When he began to teach, the equivalence of heat and energy was not yet recognised. Kinetics form the keynote of his work, and the kinetic theory of matter was the subject of his presidential address to the Mathematical and Physical Section of the British Association at Montreal in 1884. The theories of elasticity and of hydrodynamics have become, largely through him, closely related to general dynamics; and his deductions came to his aid in dealing with very difficult tidal problems. In 1887, on the occasion of the Summer Meeting of this Institution in Edinburgh, he delivered an illustrated lecture on "Ship Waves." He improved the harmonic tide-analyser which was invented by his brother, and suggested the tide-predicter which was constructed under his supervision for the Indian Government. These investigations led to the design of ingenious machines which solve a variety of differential equations. His last mathematical researches on deep-water waves and their procession were published in 1907. His work on thermodynamics, which was commenced at the time when the dynamical theory of heat was being developed, first drew general attention to his genius; and his theoretical investigation of electricity and magnetism acted as a great stimulus to other experimenters. The British Association Committee on Electrical Standards was appointed in 1861 on his instigation, and he was an active member of many other British Association committees—those on determining magnetic force at sea, on seismological investigation, on the screw-gauge, and on the heat of combination of alloys. In 1880 he constructed his quadrant electrometer and his guard-ring electrometer for scientific research; and when the development of electric illumination necessitated the use of accurate instruments he produced standard ampere and watt balances and the whole range of electrostatic instruments which made it possible to measure potentials up to 100,000 volts with extraordinary accuracy. His latest inventions in this direction are the feeder logs for registering the variations of both current intensity and pressure on the same sheet of paper. From the year 1881 to 1900 Sir William Thomson took out twenty-two patents relating to these instruments. His telegraphic work dates further back. In 1857 his mirror galvanometer was tried on the Atlantic cable, and this instrument, and his siphon recorder of 1867, enabled telegraphists to surmount the many difficulties encountered. He was on the "Niagara," which landed the shore end of the first transatlantic cable in Newfoundland on 5th August 1857, and again on the "Great Eastern" when she carried the cable that in 1866 finally linked the two worlds again. For these services a knighthood was conferred upon him in 1866. His mariner's compass is on every ship in the British Navy, and his recording log is used on every British ship above a certain burthen and speed, as regulated by the Board of Trade. His patents relating to improvements in telegraphic apparatus, dating from the year 1858 to 1896, were eleven in number. 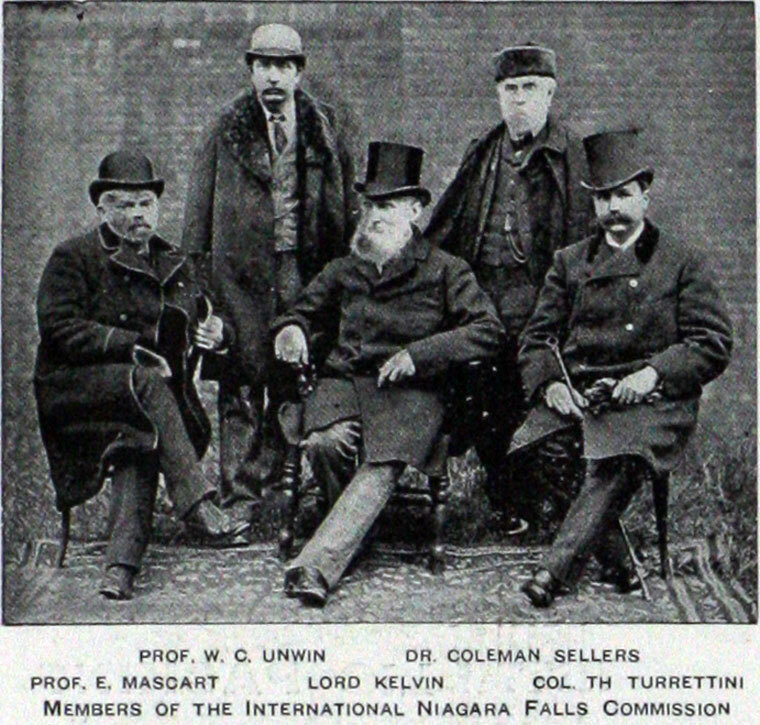 His inquiries in the "sixties" into the doctrine of uniformity in geology and the age of the earth brought him into collision with many geologists. In his treatise in 1901 on the "Clustering of Gravitational Matter in any part of the Universe," he emphatically re-asserted what he had believed years ago—that there was matter which was not gravitational, and that the ether was outside the law of gravitation. He had always been a staunch advocate of the metric system, and regarded the British system as one involving unnecessary toil and waste of brain power. No scientist has been honoured like Lord Kelvin with degrees, diplomas, medals, titles, and decorations. In 1892 he was created a Peer, which was followed by a Privy Councillorship, the Grand Cross of the Royal Victorian Order, and the Order of Merit. He was also a Grand Officer of the Legion of Honour, and a Knight of the Prussian Order "Pour le Write." He was twice President of the Royal Society of London, three times President of the Royal Society of Edinburgh, and three times President of the Institution of Electrical Engineers, having accepted nomination last summer. In 1905 he accepted the Chair of the Faraday Society; he was Honorary President of the Paris Electrical Congress of 1889, and of the Glasgow Engineering Conference of 1901, of which this Institution took charge of Section III. (Mechanical). In the latter year he was elected by the Council an Honorary Life Member of this Institution. He was President of the British Association at the Edinburgh Meeting of 1871, and up to the last years was a very regular attender at the meetings, his participation in the discussions being particularly looked for ward to in the Mathematical and Physical Science Section. The fiftieth anniversary of his professorship in 1896 brought more than two thousand friends, delegates, and pupils from all parts of the world to Glasgow University. Practically he worked up to the last, for his illness was of only two or three weeks' duration. His death took place at his residence in Largs, on 17th December 1907, in his eighty-fourth year. WILLIAM THOMSON, BARON KELVIN OF LARGS, O.M., G.C.V.O., died at his residence, Netherhall, Largs, in the County of Ayr, on December 17, 1907. He was an Original Member of the Institution, and was President in 1874, 1889, and 1907. He was elected an Honorary Member in 1899. A full account of his life and work is contained in the first Kelvin Lecture by Dr. Silvanus P. Thompson, F.R.S., Journal, vol. 41, p. 401. 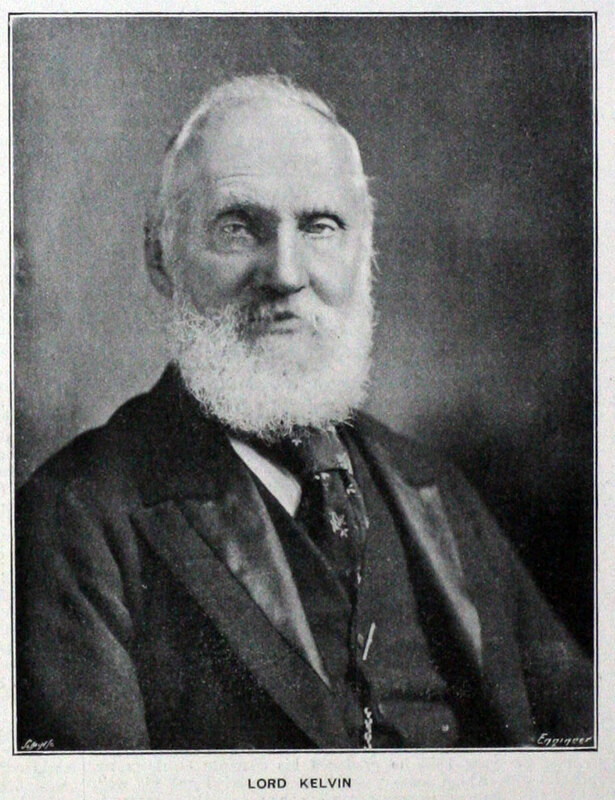 A portrait of Lord Kelvin was published with part 188, vol. 40 of the Journal. This page was last edited on 29 September 2018, at 07:43.